One of my favorite things in the world is problem solving and finding a solution. Give me an overhand knot and I’ll untangle it. Tell me something is impossible, I’ll find a way. Show me a problem, yo, I'll solve it. Because in my world, there ain’t no problems, just solutions not yet found. And that is exactly what a vegan semla (aka shrove bun, a traditional sweet bun filled with whipped cream and almond paste or raspberry jam and consumed for example in Finland, Sweden and in Estonia at Shrove Tuesday / Pancake day.) without gluten, dairy, yeast and refined sugar appeared at first. Sure, I had made gluten free and yeast free semlas many times before, but they always included eggs. With eggs it is easy. With eggs everything is easy. 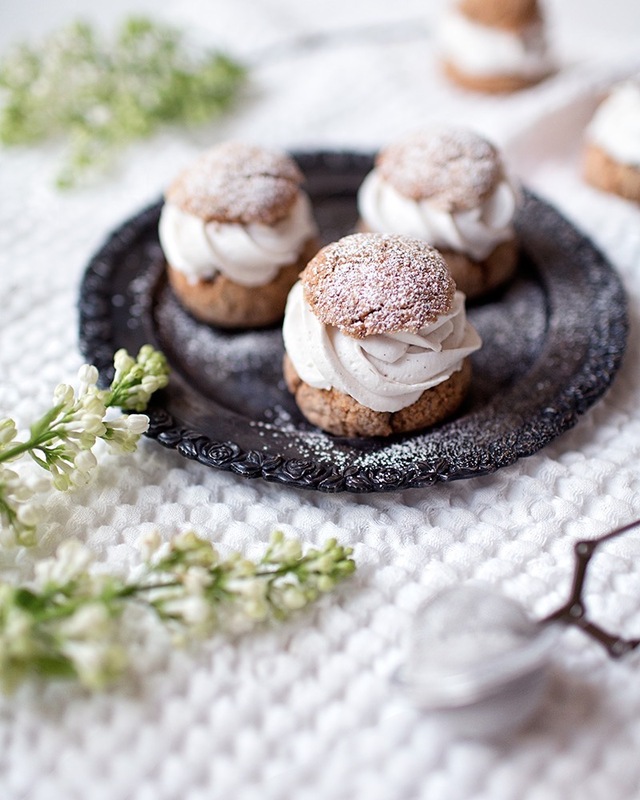 And then, on the other hand all the vegan semla recipes they include usually white flour and yeast. With white flour and yeast it is easy. Even a baby can do it. 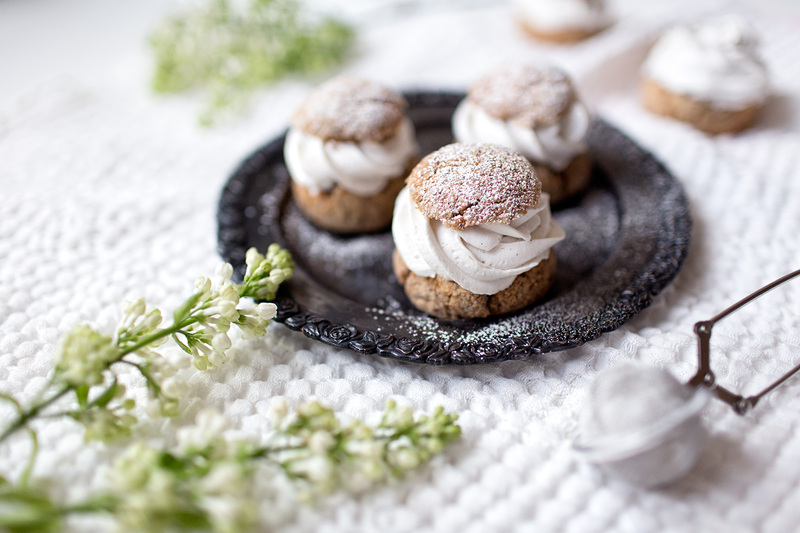 But to make a vegan semla, that has a nice and soft texture, that doesn’t crumble, that has a heavenly taste and none of those belly swelling ingredients – THAT was a tricky equation. That was something I just had to get involved. So I made my math and baked the first batch. Disaster. The taste was good but the texture was horrible. Let’s modify the recipe and make another batch. Buns come out all flat. Ok, the third version usually always works. Not this time. The taste is great, the texture is better, but buns remain raw on the inside no matter how long I bake them. And finally when they are done, they look horrendous. At this time a normal person would just say, oh well, let’s just eat pancakes then! But a maniac like me – is just getting started. So I roll my sleeves, take a deep breath and go to the mattresses. I twist the recipe here and there, pour a little bit more of this and less of that. Change the baking temperature and add a new ingredient. In my head the buns should come out brilliant, but you can’t never be certain when it comes to baking. There is always a bit of magic involved, and a lot of chemical reactions happening that are hard to predict. But with high hopes I send my buns to the oven. And with a growing excitement I take them out, split them and fill them. …And with happy tears in my eyes I finally eat them. I’m in love with these semlas. My family is in love with them too. Please do try them also. With the vanilla flavored coconut whipped cream and super easy homemade almond paste. They just belong together. This equation equals love. TIP: If you don’t like almonds, you can replace almond meal with 1/2 cup of coconut flour. In that case you can replace the chia -water mixture with 3 organic eggs. Whip the eggs with the sugar until light and fluffy and then add to dry ingredients with whipped coconut cream. Always add enough flour or whipped coconut cream so that the dough is nice and fluffy, not crumbly and dry or too sticky or loose. Preheat the oven to 350 / 175 C F degrees. Mix chia seeds and water in a small bowl and leave to thicken. Take the coconut milk can from the fridge and scoop out the white thick paste into another bowl. Whip until fluffy. Mix the dry ingredients in a third bowl. Add the chia mixture and the coconut whipped cream and apple cider vinegar. Mix. Leave the dough to thicken for about 10 minutes. The dough is ready when it’s easy to handle and you can mold buns from it and they’ll retain the ball shape without flattening. Add flour if needed. Mold small round buns from the dough on a baking tray covered with a baking paper. Grease with water-syrup mixture. Bake in the oven for about 30-35 minutes until buns get nice golden color. Take from the oven and let cool totally. In the meantime prepare the fillings. 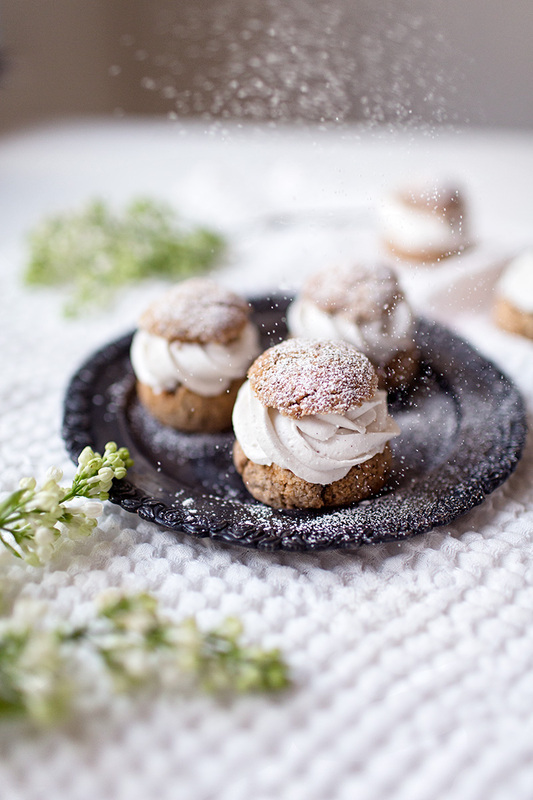 When buns are cooled, cut off the hats and fill with almond paste slice and coconut whipped cream. Dust lightly some coconut flour on or sprinkle on some shredded coconut. Serve and enjoy! Store in the fridge. Take the coconut milk cans from the fridge and scoop out the white thick paste into a bowl. Add syrup and vanilla. Whip until fluffy. If the mixture gets too warm and runny, keep in a fridge for awhile so that it gets as thick as normal whipped cream. Use as a filling in semlas with almond paste. ½ tsp vanilla powder or seeds from half vanilla bean. Mix all ingredients in a small bowl with a spoon. The dough should be easily moldable, like playdough, not too dry or crumbly. Add more syrup or almond meal if needed. Roll the dough into a pole (about 5 cm / 2 inches thick) and roll it inside a parchment paper or plastic wrap. Put it in the fridge and leave to thicken for at least 1 hour, or overnight. Cut the pole into 1 cm/½ inch thick slices. Use slices inside semlas with coconut whipped cream. Vitsi, mikä herkku! Kiitos, tämä menee kokeiluun heti kun löydän psylliumkuitujauhetta. Testasin ohjetta pelkillä kookosjauhoilla (1.5dl) ja 2 kanamunalla, en käyttänyt omenaviinietikkaa ollenkaan. Pullat kohosi hyvin, eikä lässähtäneet ja maku on tosi hyvä. :) Ja tuo mantelimassa on aivan ihanaa. Kiitos tästä ohjeesta! kiitos pähkinättömästä ohjeesta :). Menee kokeiluun ilman kanamunia (koska allergia). Tarkoitaako 1 cup = noin 2,3 dl? Tänä aamuna nautiskeltiin näistä todella maukkaista laskiaispullista. Mantelimassa on myös hyvää. Eipä ole tullut mieleen, että näin helpolla se valmistuu. Taidan tehdä tänään uuden satsin pullia. Kiitos ihanasta ja helposta ohjeesta. Ihanaa! Menee varmaan kokeiluun. Joskaan kananmunattomuus ei ole must... Onko sulla linkata jotain lempi-pullaohjetta, joka olisi vehnätön, maidoton ja sokeriton? Tai no, ehkä sitä vois pyöräyttää näitäkin vaikka ihan harjotuksen vuoksi, jos joskus tulee joku vegaani kylään. hei, tätähän voi kyllä testata kananmunillakin siten, että korvaa tuon chia-vesiseoksen n. 3 kananmunalla. itse en ole kokeillut tosin, mutta luulisi toimivan! Hei, tässä Vapun alla pohdin, olisiko tästä taikinasta munkkitaikinaksi...? Ihana pullaohje, mutta nyt tällä kertaa jäi tällaiset pullat tekemättä tarvikkeiden puutoksen takia ( jauhot ) ja päädyin tekemään hiivallisia, mutta spelttijauhoilla ja hunajalla. Hiukan sentään terveellisempiä :) Pitää käydä täydentämässä jauhovarastoja ja kokeilla sitten. Olen yrittänyt siirtää koko perhettä terveellisempiin herkkuihin vähitellen. Eilen tein runebergin torttuja ohjettasi mukaellen ja hyviä tuli :) rnEn ole koskaan ollut mitenkään superfani mantelimassaa kohtaan, mutta nyt itse tehtynä... NAM! Olen aikaisemmin ostanut sen kaupasta, mutta nyt ne saa jäädä kaupanhyllyille. rnKiitos ohjeistasi!!! no hei kiitos sulle kommentista! ja eiks vaan ookkin tuo kotitekoinen mantelimassa mmmelkoisen mmmaukasta! mmmm. rnja hei mahtavaa luovuutta runebergin torttujen kanssa, ja hyvä jos onnasi. :)rniloa talveen! ...niin, ja hei tuosta kookoskermavaahdosta pitkin sanomani, että siihen kannattaa lisätä tarpeeksi vaniljaa ja makeutusta, jos on arka kooksenmaulle! :) ja kookoskermavaahdon pitää mielestäni olla myös jääkaappikylmää, jotta maku on parhaimmillaan. Minä korvasin mantelijauhot kookoshiutaleilla ja gluteenittomalla jauhoseoksella,toimi vallan loistavasti. rnPariin otteeseen olen nyt pullia leiponut ja maistuu lapsillekin.